The Marvel Cinematic Universe is currently in upheaval after the events of Infinity War, which has also left behind a huge mystery. While we know that most of the characters that turned to dust with the snap of Thanos' fingers will return, it isn't clear who will return or even how at this point. However, Drax the Destroyer actor Dave Bautista has confirmed that his character will be back for Avengers 4 and Guardians of the Galaxy 3. Drax, along with Mantis, Star-Lord, Peter Parker, and Doctor Strange were all wiped out on Titan after Thanos completed his journey, leaving Tony Stark and Nebula alone. 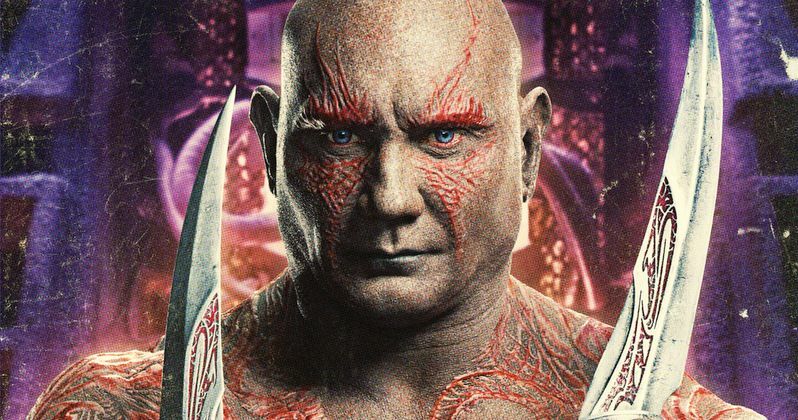 Though he doesn't know how it will happen, Dave Bautista has revealed that Drax will be back for Avengers 4 as well as Guardians of the Galaxy Vol. 3 in a new interview. Bautista says that he has to come back after friends and family contacted him after watching Infinity War. He explains. "I got a lot of texts saying, I can't believe you're dead, your character is dead. They were really like heartbroken and I was like I'm gonna be in four. I'm gonna be in Guardians 3. I don't know how they're bringing me back, yeah but somehow I'm going to make it because, as far as I know, I am going to be in Guardians 3, so I have to be back." Infinity War's bleak ending left behind a trail of questions, but the leading one is always about Peter Parker, T'Challa, and the Guardians, who all have sequels coming up in the MCU. Spider-Man: Homecoming 2 is officially starting production this summer, so we know that Peter Parker will be brought back somehow. Black Panther 2 has pretty much been confirmed and Guardians of the Galaxy Vol. 3 has an official release date. The main question for Avengers 4 will be how everybody makes it back after turning to dust. There are many theories floating around the internet that involve a parallel universe, the Soul Stone, time travel, and the Quantum Realm. It could be a combination of a few of these choices, but it is unclear at this time how everything will go down. But, time travel seems like it will have to factor in somehow and the Quantum Realm will be discussed much further in the upcoming Ant-Man 2, which hits theaters in a few weeks. Along with Dave Bautista's Drax coming back, we have seen Zoe Saldana's Gamora on the set of Avengers 4 along with some of the other members of the Guardians crew. James Gunn has said that Guardians of the Galaxy Vol. 3 will be the last of the trilogy to feature the original characters, but some might not make it out of Infinity War and Avengers 4 alive. The waiting game continues, but at least we know that there will be a healthy dose of comedy now that it's confirmed that Drax will be back in Avengers 4. You can read the original interview with Dave Bautista at Collider.